Have you ever wanted to have so much money that you could do whatever you wanted? Click here to play! You could get fast cars, jewelry, beautiful women and private jets. Join Mister Money and you'll not only get to experience the lifestyle, but you might just walk away with enough cash to live a life of luxury. Diamonds are not only a girl's best friend, but they pay off big time especially in Mister Money's world. If you can spin five Diamonds, you'll get up to 5000 times your original line bet. 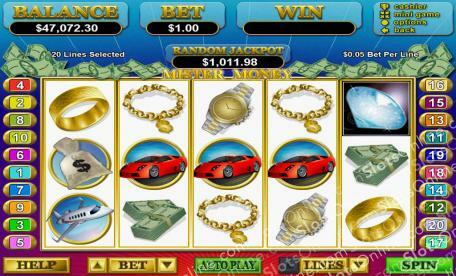 They will also substitute for most other symbols and double prizes when they appear in winning combinations. Spin two to five Mister Money icons and you'll get up to 1250 times your line bet. There's also plenty of other luxury items that will pay out, including Women, Mansions, Private Jets, Fast Cars, Money and Jewelry. There are plenty of chances to win your own stack of cash that will see you living it up. Keep an eye out for Red Diamonds. These gems not only multiply your total bet, but they'll trigger special bonus features that will award you with free games and more money! So, join Mister Money and find yourself in the lap of luxury. The Red Diamonds act as scatters. Two to five of these gems will multiply your total bet respectively. The sparkling White Diamonds will substitute for all other symbols except the scatters. Five of these icons will pay out 5000 times your original line bet. They also double all prizes when they appear in winning combinations. Three or more Red Diamonds trigger an 'on the reels' feature in which you get to choose from 15 moneybags. You'll get awarded either three free games or an increased free game multiplier.